Art Instruction four DVD set. "Fundamentals of Painting", "Painting Techniques", "Abstract Painting" Abstract Painting 2. Great DVD's from a great artist, wish he'd do more. I was very happy to receive and watch this video. I watched all Michael's videos on YouTube, but hearing him speak and explain in great details his process was awesome. I loved everything about his Abstract Painting DVD and I want to see more from Michael. Haven't watched these fully yet, but what I have watched has already paid for itself. Really pleased with what I have learned. Worth every penny and more! Great info on the dvd and only 30 mins in. Highly recommend this dvd set. Great help to an avid fan of your YouTube demos. Learned more in 5 mins on this video than on dozens of other books & videos. Michael Lang puts together a satisfying lesson (a landscape) that includes his masterful use of the paint and medium. He exudes looseness and confidence the entire time he "searches" for just the right tone, the right light, the right nuance. For me, the best moments in the demonstration occur when he makes those thin washes in important areas that fine tune the project at hand, and then he makes the wonderful adjustments all over the work that result from those changes. All with a to-the-point, no nonsense running monologue telling me why. I look forward to watching it again and again. I liked Lang's straight-up no fooling around style of instruction. His paintings are amazing and he quickly takes you through the process of creating a good composition, which is THE most overlooked thing that new painters do that keeps their art from being wonderful. I found his methods interesting, and the demonstration was very thorough. I'd really like it if he would do another that addresses his other popular style of abstract planes. The information provided is given in a chronological order that makes sense and very easy to follow. I recommend this DVD to all who aspire to be a successful artist, as well as those who paint as a hobby. Michael is generous in sharing his techniques and watching him paint is mesmerizing. I got lost in the painting process and in the beauty of the painting. Michael, I received the DVD today (The Fundamentals of Painting). Had to watch it all the way through. The start to finish process along with your explanation of what you were doing really helped show how you work with the wash and pull out that fabulous light your painting always display. I highly recommend the DVD to those who want to learn this technique. § Packaged very well too. Thanks again for the DVD. Hope to see more by this artist - more on technique. 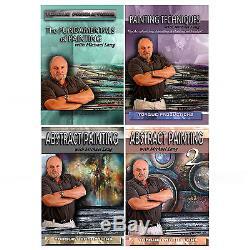 The item "Painting Instruction, Art, How To, DVD set of 4 by Michael Lang" is in sale since Tuesday, January 19, 2016. This item is in the category "Crafts\Art Supplies\Instruction Books & Media". The seller is "slickster1210" and is located in Liverpool, New York. This item can be shipped worldwide.